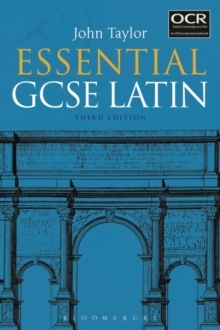 Essential GCSE Latin is a practical and accessible guide for students. This third edition is updated for the OCR GCSE (9-1) specification (first assessment 2018). It covers all the linguistic requirements for GCSE Latin, providing straightforward and helpful explanations of every grammatical construction. Each point is illustrated with examples and practice sentences (650 in all). With an easily navigable structure and generous cross-referencing, Essential GCSE Latin concentrates on understanding principles and patterns, reducing the need for rote learning. Concise and clear, it is ideal for those on a reduced timetable, or as a supporting grammar and exercise textbook alongside other Latin courses. As a revision guide it provides a fast but comprehensive recap of the language. The book includes a full GCSE vocabulary and a glossary of grammar terms for quick and easy reference. Fifteen practice passages for unseen translation are followed by five complete practice GCSE papers, and additional exercises for the optional English-Latin sentences. The new edition is supported by a companion website with answer keys and further resources, and is endorsed by OCR.